When i spied this hand carved Antler Scoop on Instagram a couple weeks back, I was hoping the creator was southern. Lucky for me, it was Anneliesse McKee from Asheville, North Carolina- one of my favorite towns that I had already planned to visit a week later. So...with her permission, I stopped by for a visit and she couldn't have been more gracious. 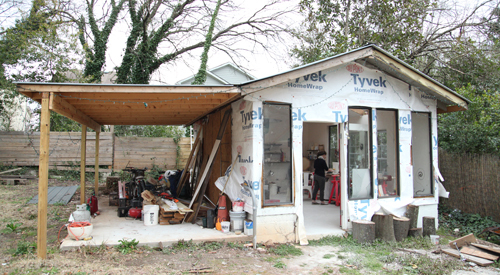 Situated behind Anneliesse's home is the perfect sized workshop. It's a place for her to zone out, focus and carve. She found this passion about a year and a half ago after a seven year relationship ended. Instead of wallowing in a bad place, she decided to put her mind in a creative, motivated space, taking up banjo lessons, running miles on end, cooking recipe after recipe... and carving. As Anneliesse shared, "I just wanted to be so proud of myself." Well, she has nothing to worry about. Her hard work, derived from a deep passion, has gained notice. Bomisch now carries her Antler Scoop and a bit more of her impressive handiwork. And restaurants and shops around town are beginning to ask for custom orders. But of course...her journey continues to propel her forward. As if her outdoor workshop isn't ideal enough, I know her pups, Bruce and Mason love the setup too. They were running in and out as I took photos and Bruce perked up when a lone piece of wood turned up on the workshop floor. And when you receive your Antler Scoop, there is really no question it was made and cared for by hand with lots of care. 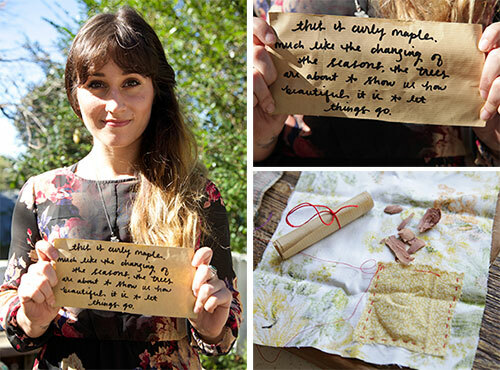 Anneliesse wraps it in vintage fabric, adds some of the wood shavings from the carving session in a little sewn pocket and includes a thoughtful saying on brown paper. Her friends often come over, they drink wine and put these together. It's a gift to cherish. So is this artist. Using a variety of pigments, such as gauche, acrylics, oil pastels and chalk, Memphis artist Megan Hurdle creates colorful and engaging mixed media pieces on paper. Megan's signature pieces have been her skulls, which explore the masculine side- but she's delved into dresses and costume paintings as of late, shedding light on the feminine. Megan, "Ever since I was a young girl, painting till 4am in my grandmother's studio, I've seen the world a little differently. It has granted a perspective that has driven me to create things that elevate the mundane, make beautiful what many might see as ugly and connect, if only for a moment, with the raw, the real, the remarkable." See all of Megan's current works here....& enjoy your weekend everyone! If you're a Sweet Peach fan, you know I follow Jenny and Cody of Cast & Crew in West Texas. They always seem to curate the coolest stuff from the 50's, 60's and 70's. As they say, "We are quite simply a couple with a craze to find and resurrect pieces of the past." Their latest venture are custom deer antlers. 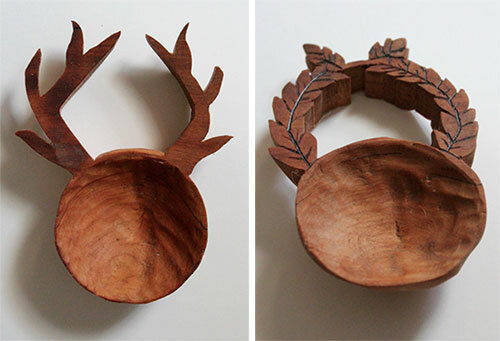 Last year, the pair came upon several crates of old antlers from a longtime hunter and saw an opportunity to craft a unique and stylized product for their shop. 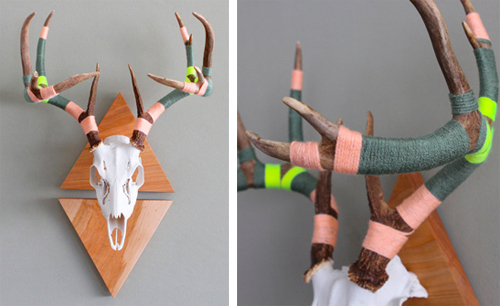 Inspired by the graffiti knitting craze, Jenny meticulously wraps the antlers with various shades of yarn. The antlers are then flush mounted on an arrow wall plaque made in either dark walnut or natural maple. The final product is both modern and playful. Have Jenny and Cody customize your own set of deer antlers here and click here to see their entire Etsy shop. Courtney Hamill has a pretty good gig. 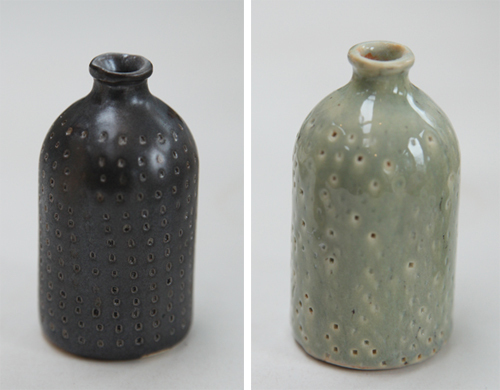 Working full-time in her backyard studio in Atlanta's West Midtown district, she handcrafts porcelain and stoneware pottery. 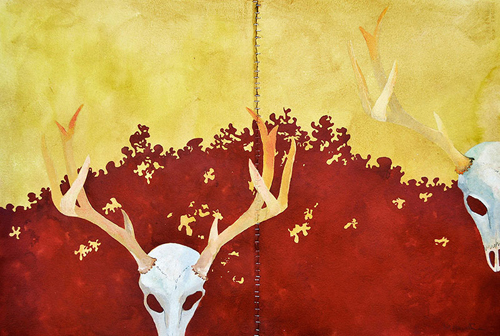 I particularly love her antler series. Starting from above left is a real springbok antelope antler, Courtney's slip cast mold of it, then the final glaze with her signature gold tip. Courtney has found her niche in the market. As she recently shared, "There are very few well done ceramic horns and I don't know of anyone making porcelain antlers like this." Each antler is left hollow and is lightweight, making for a beautifully unique and decorative piece. This one is a small white-tailed deer antler. For this past holiday season, Courtney also crafted these decorative Turtle Doves, which have become quite popular. 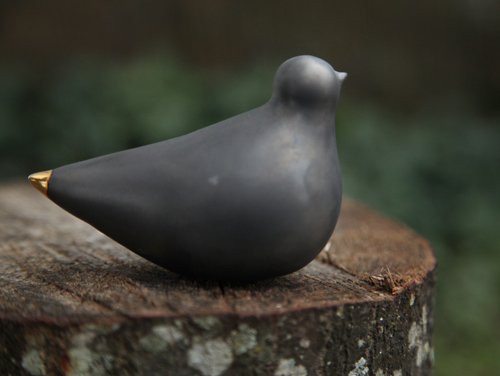 She particularly likes how good the doves look in multiples. Find them in black or white, here. 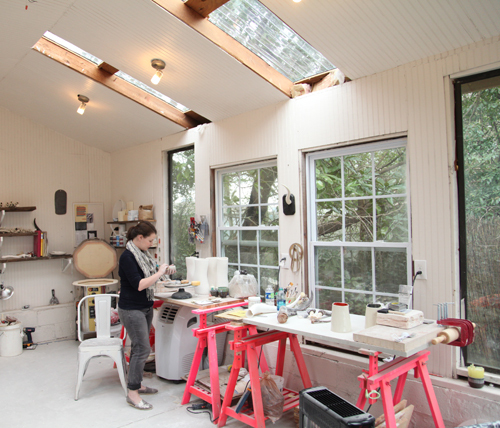 Her studio is a work in progress but with the skylights and large windows, it offers incredible natural light. It's a tranquil area for an artist to work- and it's just a few footsteps from her back door. Courtney continues to expand her line of wares and has been playing with various sized vessels and holders, all of which I'd love for my own home. With an impressive collection created in just the past year, Courtney is an artist to watch. See her entire collection here.